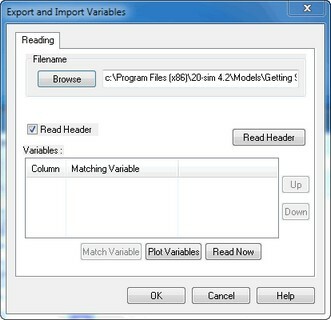 From the File menu, you can choose Import Data From File to import a previously saved simulation plot. A window will pop up allowing you to specify the filename and variables that should be plotted. If the file contains a header describing the variables inside, they will be shown in the variables dialog. • Filename: You can select an existing filename using the browse button or type one. Data can be read as text file or as binary format. • Read Header: Select this button if you want extra information (variable names etc.) to be read from the data file. • Variables: The variables box shows the number of columns that were found in the data file. Each column must be matched with a variable that is shown in the plot. Click with the mouse on a column number to select it. Then click the Match Variable button. This opens a Variable Chooser in which you can select a variable. When a header was used when storing the data file, this matching is done automatically. • Match Variable: Use this button to select a matching variable for each column in the variables box. • Plot Variables: Use this button to put the same variables as shown in the plot into the columns of the variables box. • Up/Down: Use the Up and Down buttons to change the order of the variables shown in the list. You can use the Export Data To File command to store simulation results of time consuming simulations. For later use you can use the Import From Data File command to read the result from file.